As it is, Satan is a being in Christian mythology that needs no introduction. Both theists and non-theists know who he is and what he is supposed to represent. According to Christians, Satan (or sometimes Lucifer) is the arch-rival to the all-powerful, all-knowing God and actively strives to undo his divine works. God, we are told is the source of everything good, and Satan the source of everything that is evil. We are also told that Satan is extremely influential, that he and his army of demonic minions are constantly roaming the planet deceiving and manipulating people. As such, all evil, death, suffering and unbelief in this world can be attributed to the devil and his schemes. In spite of all this chaos, Christians still believe that their god is in complete control, but for some inexplicable reason, has chosen to keep this cosmic malefactor around even though he could have simply just destroyed him at any time. This, we are told is part of some grand, divine plan we are too puny to understand. It does seem strange that an omni-benevolent god would not only create an thoroughly evil being like Satan, but that he would allow him such tremendous power to use so effectively in thwarting his own will. In fact, one could argue that if the Christian myth is taken to its logical conclusion, Satan is at the very least just as powerful as god or, at the very most, even more so, which completely undermines the Christian message. With this article, I will attempt to prove this very point, and for the sake of argument, will disregard the obvious fact that the Christians claims about both God and Satan have never been proven to be anything other than elaborate make-believe. To the Christian, everything in existence falls squarely into two camps: either something is good and consequently of God, or it is bad and of the devil. There is no middle ground whatsoever. This purely dualistic, black-and-white thinking forces Christians into believing that anyone who does not believe in their God is automatically a follower of Satan whether they are aware of it or not. Owing to the aforementioned duality of thought, believers like to assert that any worldview, philosophy or scientific discovery that contradicts the bible and its claims is demonic. This is a great way of deflecting any and all criticisms of Christianity while keeping the fearful sheep in line. Dont believe in talking animals, a young earth and a six-day creation of the universe? Believe that dinosaurs exist and evolution to be true by virtue of the mountains of evidence in its favour? Think that meditation actually has some therapeutic benefits? Well, youve just been deceived by the devil and have bought yourself a one-way ticket to A Very Hot Place Indeed. Christians tell us that the reason proven facts such as evolution, dinosaurs or an old earth appear believable is because of Satans ability to deceive. Yes, hes so cunning, we are told, he can actually present something that looks much more credible than the words of almighty God himself, causing many to be unwittingly tricked into hell. As a result, Christians assert that one should be wary of anything that contradicts the bible and should even disregard their own reason or intellect because Satan can use those faculties to snare the impressionable by appealing to their pride and vanity. In the meantime, God, with all his majesty and glory is somehow unable to equivocate himself to the beings he created and, we are lead to believe, actually posits himself against the very same reason and intellect he created in the first place by hiding all evidence of his existence and demanding his followers rely on faith alone to perceive him. What we see from this is a common, recurring theme in Christianity, where their God creates people with specific attributes and then sets everything up in such a way that it becomes sinful to use them. We are then told that anything appealing to those attributes is of the devil. Whats even more bizarre is that the deceived are held responsible for what happens to them by God, who will punish them with eternal hellfire for being tricked by a third party. God is less powerful than the devil since his sacrifice didn't actually guarantee salvation for anybodyAs before, Christianity posits God as all-powerful and his arch rival Satan a defeated foe, whose hold over believers was cancelled by the holy blood sacrifice of Jesus. Conversely, all non-Christians are still unwittingly enslaved by the devil by virtue of their non-belief, which suggests that Jesus sacrifice, (intended to save all humanity) was limited in its scope and was only really able to save a select few (that is, Christians). This again implies that God is less powerful than the devil since his sacrifice didn't actually guarantee salvation for anybody. Satan is powerful enough to cause sickness, death and suffering. Christians covered in the blood of Jesus (a macabre concept if ever there was one), automatically have the advantage, but the devil is still able to cause sickness, death and suffering in the life of said believer should God, for some reason choose to allow it. That an all-powerful God is only able to protect his followers if they telepathically put on invisible, magic armour (Ephesians 6:10-17), which makes them immune to attacks from invisible monsters in the spirit realm, and that without this protection, this all-powerful God is utterly powerless to help them. That Christians can heal people in Jesus name, but that same Jesus is not powerful enough to keep them healed, and if a condition ever returns, it is ultimately the persons fault for either sinning, forgetting to pray or not believing hard enough, thus allowing Satan a foothold. An unsuspecting person can be deceived by the devil into believing something that isn't true while God sits back and watches, knowing this will lead to their eternal damnation, even though it is actually his will that none should perish (2 Peter 3:9). God created a perfect world that became imperfect within days of its creation because the devil tricked the first humans, resulting in millions of people being born imperfect and destined to roast in hell forever when they die because of something that allegedly happened before they were even born. Also because of this, Satan now rules and controls the world God created. Epic fail on Gods part. The devil can quote the bible to fool Christians and is even able to masquerade as an angel of light (2 Cor 11:14). Satan is the prince of the powers of the air (Eph 2:2) and can use this power to invisibly interfere with prayers and stop them reaching god. From that list, it would appear that God is constantly on the back foot and always playing catch-up to a lesser being that seems able to best him at every turn. Where Satan acts, God reacts and when Satans works of death, sickness, deception are unleashed, God does absolutely nothing and even blames the deceived for being tricked by the devil unawares. 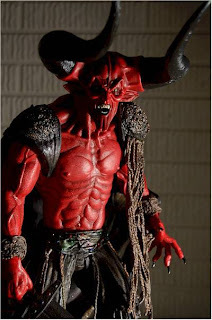 Whats more, Christians would have us believe that at the End of Days, most of humanity will end up going to hell with Satan and his demons, which suggests an overwhelming majority win for the devil. What we can conclude from everything written here is just how flawed the Christian concept of the devil really is in relation to a supreme, all-knowing, all-powerful God and, above all just how stupid it all sounds. Christians say their God is omnipotent, but at the same time has to contend with a lesser adversary who often gets his own way in spite of what God wills. When this happens, they argue that its part of Gods plan. As such, the Christian tries to have it both ways. This disparity was something I often struggled to understand when I was a Christian, as I was constantly reminded of the devils schemes and how he was always looking to (and often would), confound Christians through spiritual warfare. In the light of everything I was taught about God, this didn't make any sense, and in the final stages just prior to my complete de-conversion, I concluded that it would be exceedingly cruel for a god supposed to be all loving and all powerful, to allow an evil supernatural being free reign to run amok and batter his creation at will. It would be like a parent deliberately placing a cobra in their childrens bedroom then punishing those children for being bitten. So, taking all of the above into consideration, who really is winner in this cosmic fairy-tale? Who really has the upper hand? If this were an electoral race for presidency, who do you think would come out on top? Who is really the daddy here? I'll leave you to decide.